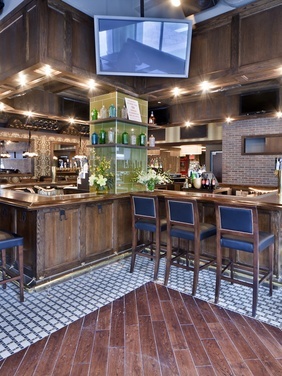 Park Avenue Tavern holds a special place in our heart as it is where we hosted our launch party a while back. It's the classiest "tavern" you'll ever go to, and is especially great if you need to accommodate a group of any size, small to large. Book the Barrel Room downstairs for a big birthday or baby/bridal shower. Since finding legit restaurants near Grand Central can be a chore, make sure you bookmark Park Avenue Tavern as your next midtown spot. The menu offers a great mix of both breakfast and lunch items. We like the Pastrami Hash, the French Toast and the Hot Ham & Cheese -- their version of a Croque Madame, made double decker style. Every Saturday and Sunday brunch, Park Avenue Tavern offers half price bottles of wine. Additionally, they serve some of the cheapest brunch cocktails around. A mere $5 will get you a Mimosa, Bellini, 007, Huckleberry Lemonade, or a Sham-pagne (white grape, ginger beer, and pineapple).